A bill to be tabled seeking a Fresh push for a succession of the Kenyan Minorities in the parliament. - Kilifi North MP Owen Baya. - Bana Kenya News, Real African Network Tubanane. Home Mombasa A bill to be tabled seeking a Fresh push for a succession of the Kenyan Minorities in the parliament. - Kilifi North MP Owen Baya. A bill to be tabled seeking a Fresh push for a succession of the Kenyan Minorities in the parliament. - Kilifi North MP Owen Baya. 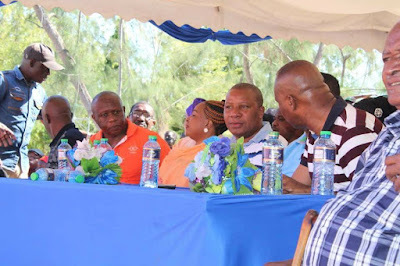 Kilifi North MP Owen Baya has shocked the Central Nation saying that he has plans of introducing a bill of succession which he claimed to have a quorum. The bill which will seek of Coast region separation or minorities separation will make the people feel from the marginalized communities included in their governance. He argues that the Kenyan constitution gives a leeway for self-determination, which he plans to seek. The Kilifi North MP said the ongoing battle between NASA and Jubilee will end up with succession which he is preparing it now. "The battle is between minorities and Majorities so I will table the Motion as the battle continues, we will be preparing for another succession battle which I think will end this row of governance," he said. He spoke in Kinango during the home welcoming ceremony of MP Benjamin Tayari. "We need to be free from modern and black colonialism, we are tired of the how the successive governments are doing towards other regions," he added. "Just like other regions, Coast has daughters and sons who can lead the country. Nyanza, Western, Eastern has their own who can lead this country. So if they feel to be the Majority then we think the minorities could join hands too." Likoni MP Mishi Mboko said. In 2002, the government successfully executed the Mombasa Republican council members including the Chairman Omar Mwamnwadzi who disappeared mysteriously in the government hands and the declined aim of coast succession. The Move of the succession was welcomed by the MRC members who vowed to back him up on the ground.